Born in Texas but raised in San Francisco, Johnny Mathis was the fourth of seven children born to Mildred and Clement Mathis. A former vaudeville performer, Clement found Johnny to be the most musically receptive of his offspring and taught his son songs and routines that would then be performed for visiting guests. At the age of 13, he was brought by his father to Connie Cox, a professional vocal coach who agreed to take the boy on as a student in exchange for doing various household chores; for the next six years Johnny continued this arrangement, learning vocal scales and operatic technique. During his high school years, Mathis established himself as accomplished an athlete as he was a singer, excelling on the school track team in the high jump and hurdling categories. His athletic career extended into his enrollment at SF State, where his high jump measurements approached that of the established Olympic record. His musical ambitions were not abandoned, however, and following a jam session at the Black Hawk nightclub, the club's greatly impressed co-owner Helen Noga assumed management duties for the young singer, eventually luring the head of Columbia Records' A&R into the audience. Ironically, the invitation to travel to New York for his first recording sessions arrived at the same time as an offer to try out for 1956 Olympic team -- a choice which, after some discussion with his father, was settled in favor of the sessions. 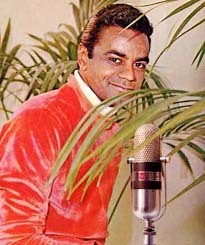 His jazz-inclined debut album, Johnny Mathis: A New Sound In Popular Song, was released later in the year, receiving only a mild reception. Undaunted, Mathis kept on in New York, extending his popularity through work in nightclubs such as the Blue Angel and the Village Vanguard before recording a second album under the direction of producer Mitch Miller. Miller shifted the musical emphasis away from jazz standards in favor of romantic ballads, resulting in two of Mathis' most enduring songs, Wonderful, Wonderful and It's Not For Me To Say -- the latter which he could be seen singing in his 1957 feature film debut Lizzie. The singer's first #1 song arrived soon after in the form of Chances Are. An appearance on The Ed Sullivan Show in June of 1957 cemented his reputation, and up through the early 1960s he continued as one of the most popular performers in the country. In 1958 Mathis moved his center of operations to Los Angeles, where he has continued to reside ever since. A "Greatest Hits" collection (the first time a record had been titled as such) was released by Columbia that same year, subsequently setting a new industry record by remaining on the charts continuously for 490 weeks. Although his presence in the upper regions of the pop charts fell away over the next decade (his work catering more to the "adult contemporary" crowd), Mathis continued to be a popular live performer, appearing at a number of head of state hosted events in addition to the usual concert venues. However, an unexpected return to the #1 position arrived in 1978 with Too Much, Too Little, Too Late, a duet with R&B singer Deniece Williams. A series of duets with other performers was to follow, amongst whom are included Dionne Warwick, Natalie Cole, and Gladys Knight. Mathis remains active to this day, having released 2 new albums in the early 00s and continuing to perform on a regular basis. Since 1999 he has hosted a charity golf tournament in Belfast in association with Shell corporation, and the annual "Johnny Mathis Invitational Track & Field Meet" has continued to held at SF State since 1982. Also in 1982 he made public his homosexuality, which had negligible impact upon his popularity. Interview, Us magazine, 1982, calling his homosexuality "a way of life that I've grown accustomed to." The following year, he informed The New York Times that he was under the impression that the Us interview was off the record. It is the only time he has publicly discussed his sexuality.